The valleys aren't so deep - with friend and family by your side. Or lift your head up high and know there's memories left to make. When Lucas Hoge sings something moves inside of you. He involves you in the music with his effortless vocals and strong beautiful lyrics. 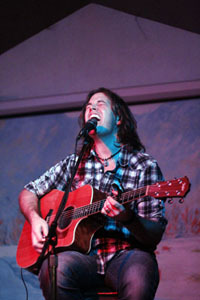 His performance showcases his talent as a singer/songwriter leaving you wanting more. In short he just draws you in! Hoge has appeared on the Today Show and Inside Edition. He stars in Animal Planets TV show "Last Chance Highway" as himself. He also wrote and perfoms the shows theme song which incidentally is a bonus track on his "DIRT" CD! 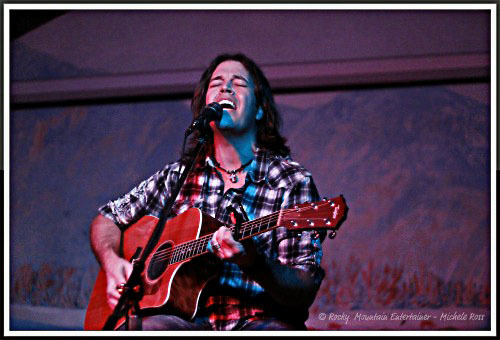 Lucas put on a stellar performance at the Songbird Cafe & Music Hall in Beulah, CO. The venue was great. Small and intimate and not a bad seat in the house. Together with bandmate Thomas Becker, the show was simple and included beautifully executed performances. Stripped down to just two men, two guitars, and two voices with a tremendous capacity to harmonize, the 2nd annual Sweetheart Serenade show was wonderful. Hoge sounded right on. With such a fun loving personality and a great stage presence, Hoge really knows how to connect with his audience. He shows them respect and verbalizes his appreciation for "the fans" as he gave us everything from "I Believe In Ghosts" to his latest hit, the theme song from Tom's Wild Life, "Give a Damn". Believe me, no matter what he was singing it was all good. With a new self-titled CD about to be released in March we were treated to a great balance of old and new songs. He wasted no time going through his playlist, performing with an obvious love for what he's doing and always sporting a smile. Honoring our troops with "Medal Of Honor" and POW 369" was easily a set highlight. Lucas joined the 16 day Wrangler National Patriot Tour to the Middle East to entertain our troops in May of 2011. 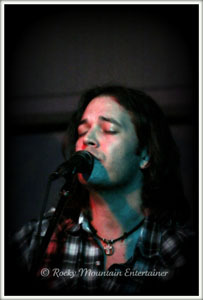 The audience cheered when Lucas told us that Wrangler has since announced "Medal Of Honor" as their official theme song. He then fired up the crowd with his version of Johnny Cash's "Ring Of Fire". When he asked the audience if he should include it on his new CD, he got a definite thumbs up! Next up was"Little Time" which had the audience clapping along, while "Day Over Beautiful" was well just that... beautiful. For me, "How Was I To Know" was my personal favorite. The words to this song was a poem written by Natalie Fognani (of Pueblo, CO) who suffered from ALS. Unable to speak and having no use of her hands, she typed some truly touching lyrics using only her computer and her toe. This song just reaches out and grabs you - simple in arrangement - yet so incredibly moving making it the emotional high point of the show. It's sad, simple and perfect, leaving you with a lasting impression. But don't take my word for it, watch this amazing video yourself and see Lucas make Natalie's poem come to life. Not to be outdone by beautiful ballads and romantic love songs, there were plenty of fun, uptempo moments, including a melody of songs, "Ring Of Fire" and as always "Dirt" which was both feisty and playful. The setlist also included "When It Rains He Pours", "Tupelo","Wild Honey","I'm Not That Guy", "Satan & Grandma" and "Little Time" just to name a few. Lucas Hoge has an incredible footprint... He is a volunteer and spokesman for many charity organizations. He is a caring, gifted young man with a heart of gold who brings creativitiy and originality to his craft. He is the perfect courier. He sings from the heart with such feeling and sensitivity that you can't help but be touched. When one organization, the Sangre de Cristo Hospice Center in Pueblo, asked Lucas for his help in raising funds he quickly wrote "Sharing The Journey". When he sang the song at the show it was so new that Lucas had the words written down just in case... It's an upbeat song with beautiful lyrics about not wasting time and making a difference. Proceeds from "Sharing The Journey" help provide patient care. You can download it here. Everyone should experience Lucas Hoge Live. Be it in an intimate venue like the Songbird Cafe or a rock arena like the Colorado State Fair Event Center his show is a must-see! He has a deep, rich voice you could listen to all day. He is down to earth and very likable - the real deal! 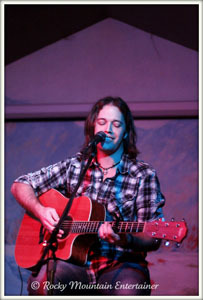 A rising star who is well on his way to a long and steady career in the country music industry. If you get the opportunity to see him perform - and I hope you do - you won't be disappointed. No doubt you too will be saying "Oh What A Show!"